Set in tropical gardens, Palace Backpackers prides itself on offering a relaxing atmosphere where you are bound to meet people and have fun! 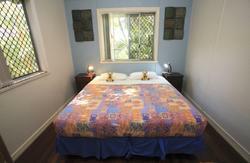 Our self contained units will have you feeling right at home. Each apartment has a kitchen, dining & lounge area. Take the time to relax around the pool, chill out in the hammocks & use our free BBQ facilities. Palace also offers great packages & self drive safaris to World Heriatge listed Fraser Island, and can help you with making the most of your time in Hervey Bay. 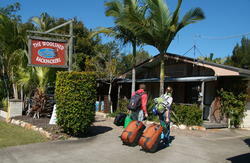 Palace Backpackers offers a FREE pick up and drop off from the Hervey Bay Transit Centre meeting all daylight Greyhound, Oz Experience and Premier Bus services. Driving? Turn off the Bruce Highway at Maryborough and follow the road into Hervey Bay. Palace is located along Torquay Rd, just 150m from the Esplanade. Call our TOLLFREE number and one of our friendly staff will guide you! Travelling by Train? Courtesy busses will transfer you from the train station to Hervey Bay, where our courtesy bus will pick you up! Flying? Airport transfers to the hostel will cost approximately $10-12 per person.